The all metal unibody designed Galaxy A series smartphones are up for grab at any of the Samsung Smartphone Cafe here at Bangladesh. 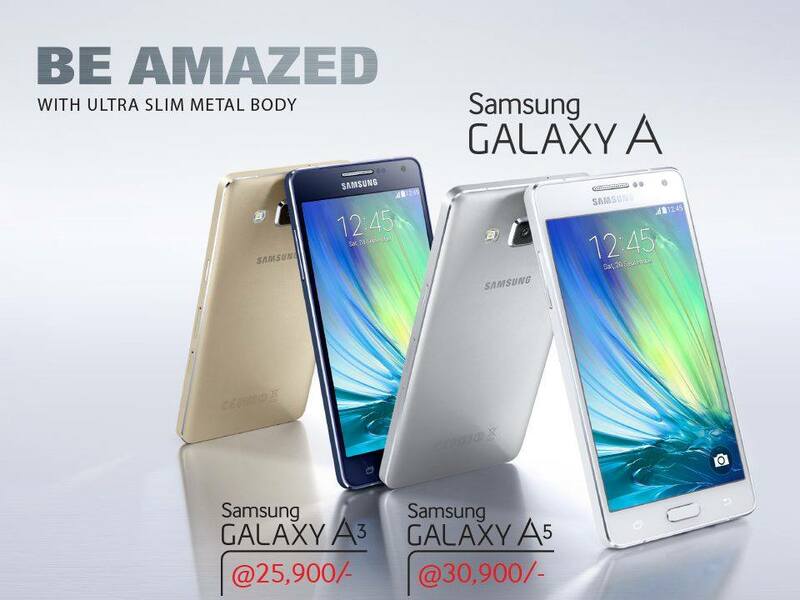 Targeting the young generations, Samsung has unveiled the Galaxy A3 and Galaxy A5 smartphones. The all metal unibody designed smartphones is now a growing trend and keeping that in mind, Samsung is now offering the ultra slim A3 and A5. But don’t make this elegant looking smartphones fool you because they really fall under the affordability margin if you are expecting the price to be sky high. The trick of balancing both ‘premium feel’ and affordability are done by the specs. Majority of the youths prefer to carry a stylish looking smartphones and shows little interest to what’s under the hood. Thus, the A3 and A5 comes with mid-flight hardwares. Both the Galaxy A3 and A5 are armed with a 1.2GHz Quad-core processor while the A3 has 1GB RAM and A5 has a 2GB of RAM. Both the device have 16GB of internal storage which is expandable up to 64GB. Running on Android 4.4 KitKat, the Galaxy A5 boasts a 5 inch AMOLED display (1280×720; 294ppi) whereas, the A3 comes with 4.5 inch AMOLED display (960×540; 245ppi). The A5 possess 15 MP rear and 5 MP front camera whereas, the A3 has 8 MP rear and 5 MP front camera. The Galaxy A3 and A5 now available at any of the Samsung Smartphone Cafe with a price tag of BDT 25,900 and BDT 30,900 respectively. To all the Samsung lovers, it is time, to BE AMAZED.